Etching, polymer gravure and carborundum with wiping printed from two copper plates, a fine, fresh impression of the only state, the full sheet, printed on 410gsm white Somerset textured paper, with margins, hand-signed and numbered in pencil by the artist, executed in an edition of 60 examples (there were also 12 Artist's Proofs, 4 Printer's Proofs and 1 BAT) printed by Peter Kosowicz at Thumbprint Editions, London, published by World House Editions, Middlebury, Connecticut, in fine condition, unframed. 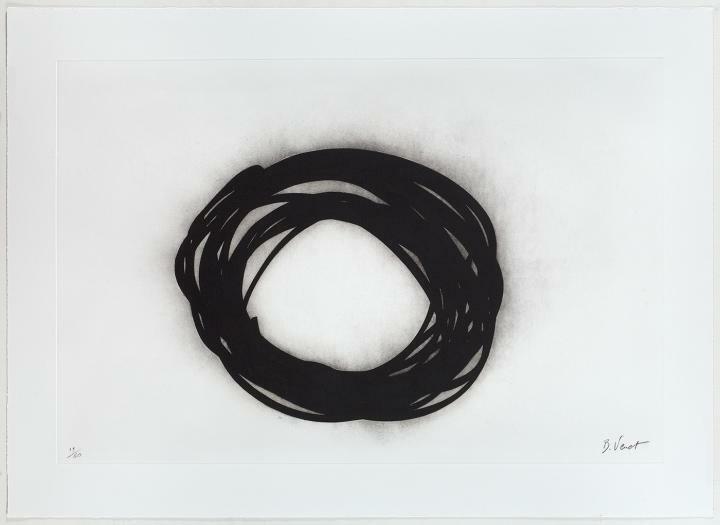 The present work is from the artists’ Gribs series, marking the first time the Gribs have been translated into the print medium. These new prints are highly representative of the artist’s torch-cut steel sculptures that seem to float off the wall. Grib is French slang for gribouillage and refers to a doodle or scribble; the kind school children did in their notebooks, often daydreaming in class. The new prints, with their intense black lines against the white ground, seem to float off of the sheet, creating a push-pull between positive and negative space. The plate size of this work is 28 3/4 x 43 3/8 inches (73 x 110 cm).